Though the high-level side-by-side comparisons I shared in the last post have their place, it would feel inappropriate to reduce each of the design process treatments we looked at in the last post to only one column in a table. Here, in the second post of our second inquiry, I review each treatment in more detail, attempting to do at least some justice to the nuances of the thinking behind each process description, and focusing in particular on the author’s presentation of the relation between the designing and implementing phases of the process. Chapters Three and Four of Dave Jacke and Eric Toensmeier’s Edible Forest Gardens Volume Two (2005) contain what is perhaps the permaculture literature’s most profound and influential presentation of design process, even if Dave, who wrote these chapters, referred to it there as a forest-garden design process, and nowadays prefers to call it an ecological design process. In subsequent chapters, Dave addresses Site Preparation, Garden Establishment, and Management, Maintenance and Co-evolution. To summarise for the purposes of our focus in this inquiry, in the idealised design sequence given in Edible Forest Gardens, you complete a detailed design before implementing it. Like Dave Jacke, after many such insightful introductory comments (including a fascinating list of 72 novel design principles ), Ben proceeds to talk and share an example journey though a sequence of steps starting with the foundational elements mentioned in the above quote and ending with what he calls a working master plan. Master plans are not solid, set-in-stone documents–although everyone wants them to be. Heck, I am hired many times largely because people want a plan that’s solid, unwavering, and something they can follow now and in ten years. Sorry-they don’t exist. Most plans are iterative. 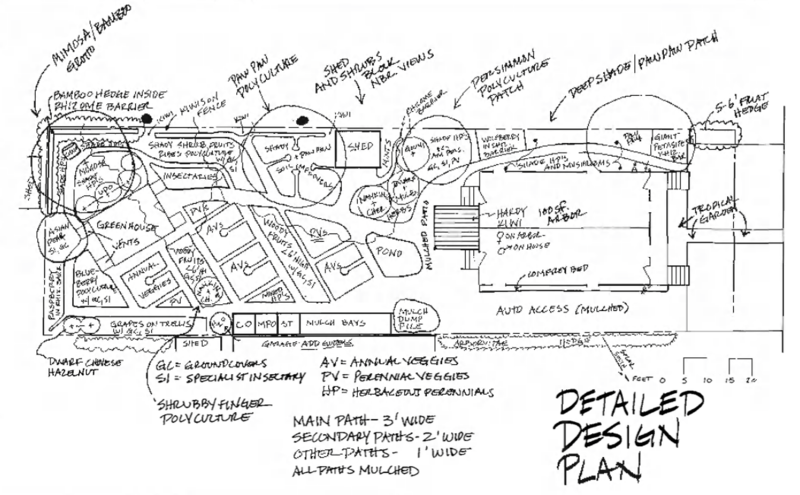 And despite the authoritative sounding name, master plans are no exception. A good ‘master’ plan is a working plan-in other words, it’s the latest version of good approaches. It will change: that much is guaranteed. The important part to remember is that it’s a guide for next decisions, not an ultimate life map or site oracle. Land and the lives unfolding for them are far too complex, unpredictable, and mysterious for any vision of a ‘way’ to hold up year after year. To sum up, amongst deep insights about the essence of design, and despite emphasising the malleability of a working master plan for a site once implementation commences, in his shared sequence and examples in The Resilient Farm and Homestead, Ben recommends completing such a plan before implementing it. The logic here is clear – complete your design, plan its implementation, then start implementing it. The idea being that you should expect to tweak your earlier design work based on the new information garnered during the process of implementing it. It is interesting here to note Toby’s choice of the word tweak which, as he explains above, implies relatively fine-grained modifications to the already-completed design. During the first stage of design… a great deal of time must be spent listening to and asking questions of a client to find out as many details as possible about what the client needs and wants, the functions the building or landscape are meant to fulfill, who will be living, working, or being served by the creation, and so on…. Given its relevance to our focus on the boundary between designing and implementing, let us explore this a little more. It is interesting to reflect that while this statement is extreme, it is probably not that controversial. 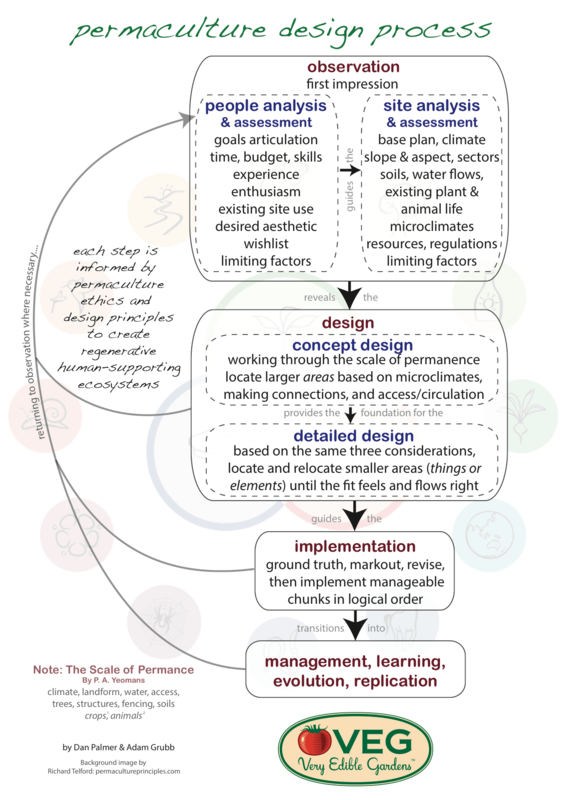 The literature of permaculture design does tend to treat design and implementation as not only separate steps in time, but as happening in separate places. Design in the head and on paper, implementation on the ground. Some people prefer to design on-site to the exclusion of designing on paper. That is certainly fine if it works best for you. …even if you want to do mostly on-site design, we recommend that you create a rough base map for site analysis and then keep the map and a notebook handy to sketch ideas, take notes, and evaluate options during the design phase. As it is presented, discussed, and exemplified across the literature of permaculture design, designing tends to happen more in the mind and on paper, though of course it also involves on-the-ground marking out / mocking up. On the flipside, though implementation happens mostly on the ground, it ideally also involves evaluating and modifying the design as well. We begin by collecting the goals and vision from our client. We look for both pattern level goals like increasing on-site food production to specific desires like introducing chickens. We use both pattern and detail level goals to inform the rest of the design process. After our first visit with the client a more formal Goals Articulation Statement will be created. Next we begin to Analyze and Assess the site. This phase of the design process begins before we arrive on the site by researching soil types, printing aerial photographs of the site and establishing a bird’s eye view of the property in relation to it’s surroundings. Site analysis continues through the initial consultation and depending on the size of the property/project additional site visits will be scheduled. This crucial data collection phase is informed by the landscape. We will be looking at slope, soils, aspect and existing vegetation to name just a few of the already existing landscape features that will support the rest of the design process. These initial phases form the foundation upon which the rest of the design process unfolds. Now we move into Design. We begin by creating a number of Schematic and Concept Designs. These designs are not detailed and act as a creative canvas, throwing all of our ideas on the table. The point at which our ideas are exhausted we distill down all of the right design elements to be included in the Final Design. Once the design is complete we move into the Implementation phase of the design process. This is where the plants go into the ground, the pond gets dug and the solar panels go onto the roof. AppleSeed Permaculture specializes in certain elements of Implementation and works with trusted professionals to ensure that all of your desired design elements get installed. The last phase of the design process is Evaluation. This is where we take a step back. The landscape informs us on the validity of our design decisions. From there the Design Process begins anew. New goals might be formed based on the Evaluation phase and so forth. Note in particular the separate boxes used to indicate design and implementation, the darker arrows showing the suggested chronological sequence of steps, and the lighter arrows indicating the return sweep of feedback from each stage of the process back to its beginning. 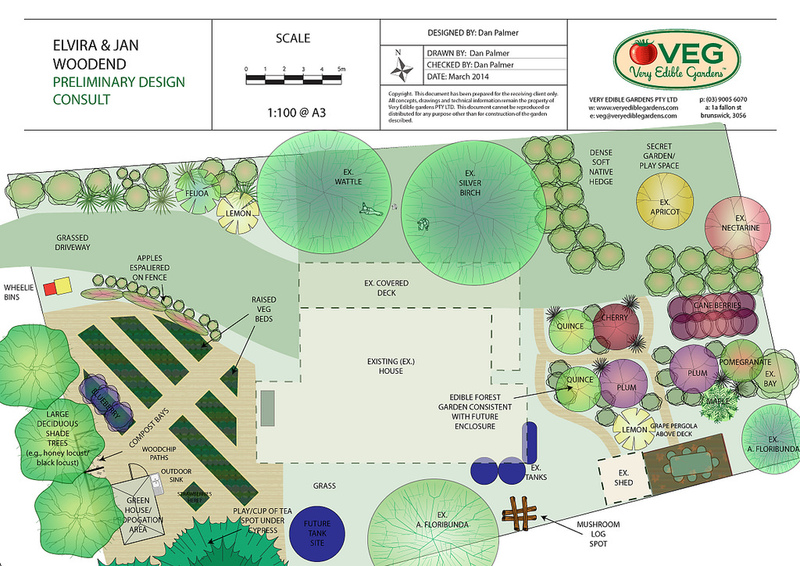 In summary, in the Very Edible Gardens process you complete a detailed design before moving into implementation. 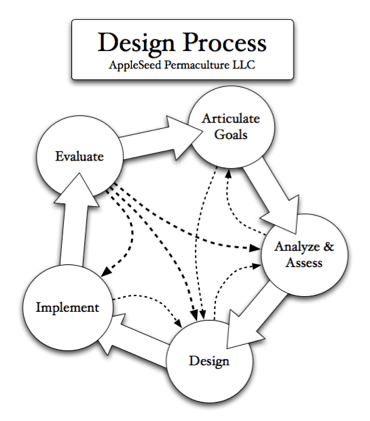 The permaculture design process consists of several phases: assessment, visioning, designing, and implementation. Once the master plan is complete, each element is designed in detail. Once the element designs are complete, budgets can be created, funding sought, and permits acquired. The sequencing of the implementation of the design takes places as part of this phase. The design process is a reiterative process that may move linearly through design steps or may circle from one to another and back again. Depending on the information that arises in each phase, steps may be revisited and the design revised. This post has examined nine different presentations of permaculture design process as a chronologically sequenced series of steps, stages, or phases. In one order or the other, you tune into people and site. You only then come up with a design, working from patterns (concept/schematic) toward details (master/detailed design). You manage/maintain/evaluate the process of implementing the design, going back to tweak, adjust or revise it as necessary. Many if not all of the treatments emphasise the messiness of the process in reality, the jumping about, the constant iterating back to an earlier phase, and the importance of treating the design as a working plan to keep revising as the project evolves. In spite of such disclaimers, after what I hope you will appreciate has been a careful and sympathetic reading of each reviewed design process presentation, this post leads me to conclude as follows: A core idea integral to how permaculture design process is understood and communicated in the permaculture literature is that of completing a design to some satisfactory degree of detail and only then implementing it. In the next post, I’ll look at a problem with this idea. Aranya. (2012). Permaculture Design. Permanent Publications. Jacke, D., & Toensmeier, E. (2005). Edible Forest Gardens: Ecological Design and Practice for Temperate Climate Permaculture (Vol. 2). Chelsea Green. In even more detail, in each of these sub-phases he suggests that the infrastructure, architecture, social structure, and successional aspects of a design need to be worked out and integrated with each other. In kindly reviewing a draft of this section, Dave explained that this quote “is spoken from the place of assuming a linear process, which almost never actually happens! But in the linear model, that quote is the idealized flow. In reality, I design the overall pattern, implement key pieces after designing them, then redesign as more parts of the system get implemented. I have never had a client where I could implement all at once as a grand expedition! It’s always been piecemeal implementation with design along the way, responding to changes in goals, site and emergent reality as the design goes into place. But having a big picture view, that is, an overall site design to at least a schematic level, is critical to help one work out where to begin the implementation. Then I would design the relevant patches, including their site prep and implementation strategies, and then proceed on the ground. Staking out is a critical part of the process! Field testing the design in reality, essentially” (from a personal email communication received January 28, 2017). For the purposes of the current inquiry, this is an incredibly important, revealing, and relevant statement I will draw on extensively in posts to come. which we thank Peter for prompting! Thanks for adding the newsletter signup. I am interested to see if you go where I think you are going with this.